At MOVE-4-U we are aware of the need to move with minimum disruption to your business. Please contact us to arrange an appointment, so we can come and do a moving survey, where we can establish what size of vehicle and equipment we will need, as well as the amount of staff needed on the day. Please contact us today to request a free quote! 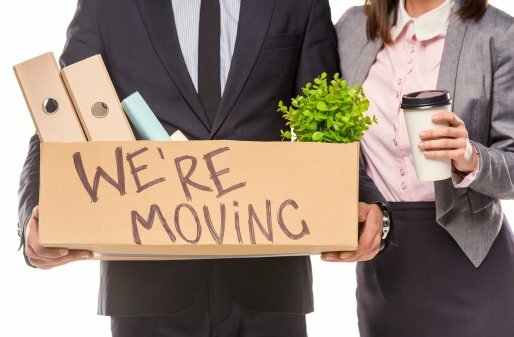 MOVE-4- U can provide a full office packing service prior to moving. Excellent quick service with the minimum of disruption, why not ask for a free quote. MOVE-4-U can provide double walled strong card board boxes for packing your office contents alternatively we can organise plastic lidded crates for you to to hire all at competitive prices as part of our moving service. Please ask for details. Your new office premises not quite ready? MOVE-4-U can organise moving your office furniture into one of the newest safest self storage places in Nottingham. Individual secure units where you have your own lock and key and security code to your unit. When you are ready we will collect your furniture to deliver to your new business premises. For piece of mind we can cover your goods on our goods in transit insurance policy whilst everything is being moved. Please contact MOVE-4-U for further information.